The combination of 390mg of caffeine and 150mg of L-theanine is a unique combination that delivers an intense sensory experience. Caffeine has also been shown to jack up energy for extreme training intensity. Delivers a proven 5,000mg dose of creatine.2 Creatine helps to improve between-set muscle recovery, amplify muscle performance, and build more lean muscle! A 3,200mg dose of beta-alanine has been added to improve muscle endurance.3 Most other pre-workout formulas deliver a questionable dose of this ingredient hidden in a proprietary blend. To assess your tolerance, start off with 1 scoop mixed with 150 to 175 mL of cold water and drink. Wait about 15 minutes and then consume an additional 1 to 2 scoops (1 to 2 servings) mixed with cold water to reassess your tolerance. 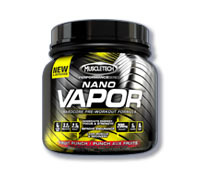 Increase the dosage to 2 and then 3 scoops mixed with 450 to 525 mL of cold water before your workout. This is an extremely potent product. Please read the entire directions before consuming and follow the tolerance assessment protocol. 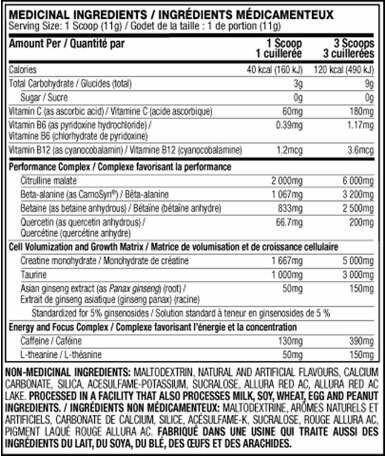 Do not exceed 3 scoops in a 24-hour period. Drink 8 to 10 glasses of water daily.